With its beautiful scenery and incredible energy, Rio is really as marvelous as they say. Needless to say, a trip to Rio de Janeiro is best spent outdoors. The city’s energy lives on the streets, as evidenced by the number of people walking around during all hours. Much of the excitement culminates in the beaches of Zona Sul, where sun-kissed Brazilians gather in troves, greeting their friends with dois beijos, kicking around a football, and spreading their cangas and rainbow umbrellas as far as the eye can see. 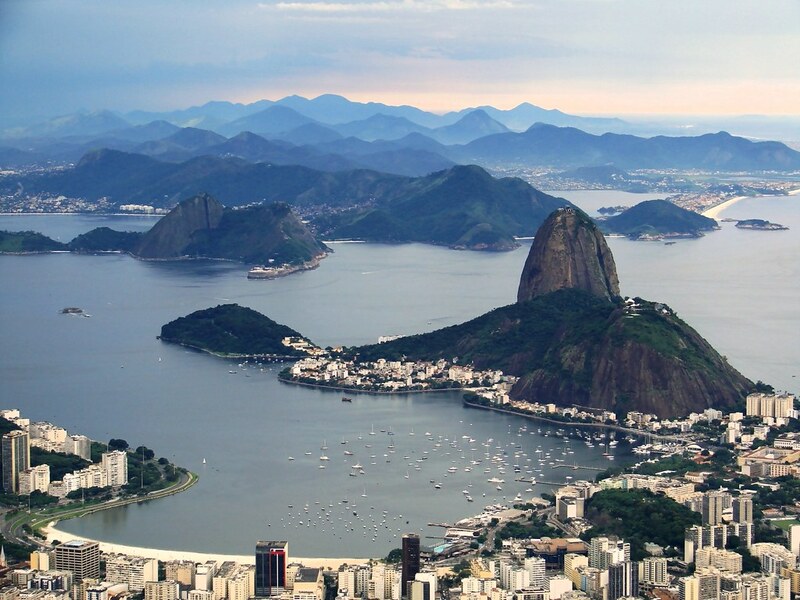 This is all to say – if you give Rio de Janeiro your heart, good luck getting it back. We could end this article right now, because Rio’s beaches are truly the heart of the city, and you could spend days there simply enjoying the atmosphere. The most famous beaches in the city are Copacabana and Ipanema, famed for their patterned boardwalks, lively beach culture, and gorgeous people. On any given day, there are hundreds of people out on these beaches, munching on Biscoito Globo or sipping an agua de coco natural. For less crowded beach options, check out the further beaches of São Conrado, Barra, or Recreio dos Bandeirantes, where many of the city’s surfers go to play. 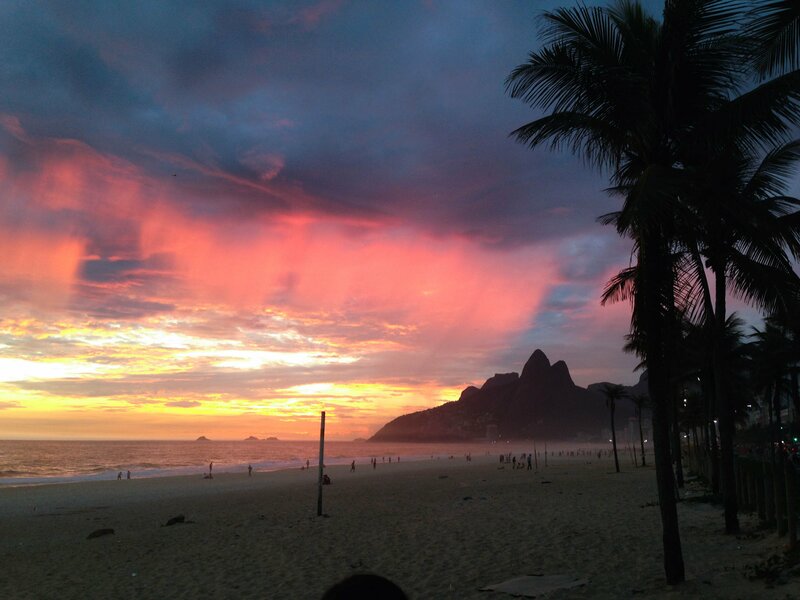 Rio’s prime sunset-watching location is a large rock in between Copacabana and Ipanema, called Arpoador. Here you can watch surfers ride some of Zona Sul‘s best waves and enjoy the breeze of the ocean. On clear evenings, onlookers can watch the golden-orange sunset over Ipanema beach, the Dois Irmãos rock formation, and the sparkling lights of Vidigal. Pack a picnic, grab your camera, and watch one of the city’s most romantic spectacles. Two of the landmarks that Rio is most famous for are Christ the Redeemer (Cristo Redentor) and Sugarloaf Mountain (Pão de Açúcar). Although they are very crowded and fill primarily with tourists, a trip to Rio de Janeiro would be incomplete without visiting at least one of them. You can head up to Christ the Redeemer on a funicular car (R$61-74) or on a tour bus. For Sugarloaf Mountain, you can take the cable car, which has incredible views along the way (R$80). For the smallest crowds, go early in the morning. In Rio de Janeiro, you could spend an entire day outdoors, basking in the fresh air and ocean breeze of the city. In the morning, taking a walk or paddleboat ride around the heart-shaped Lagoa is a peaceful way to start the day. For a close-up view of Rio’s rainforests, head to the Jardim Botânico (Botanical Garden) and Parque Lage. It’s so easy to get lost in the lush green pathways of these two beautiful parks. One of Brazil’s famed cultural contributions to the international art scene is samba music. With its unique instruments and quick movements, samba is a feast for the eyes and the heart. To experience this beautiful dance first-hand, head to one of Rio’s escolas de samba, or samba schools. Some of the most famous historic samba schools in Rio are Salgueiro and Mangueira. During Carnaval, these schools put on dazzling parade displays, with choreographed dances and incredible costumes. In all other times of the year, these schools host regular open samba dance parties, where the dancers practice for the annual Carnaval celebrations. Anyone can attend these for a small entry fee. Grab a partner, put on your dancing shoes, and head to one of these schools during an open samba night for a true Brazilian samba experience. Another unique landmark in Rio de Janeiro is the Escadaria Selarón, located in Rio’s Centro area. This colorful stair case – made entirely of mosaic tiles – is the work of Jorge Selarón, a renowned artist from Chile. The sobering story behind this piece of art is that shortly after creating this masterpiece, Selarón was found dead on the steps of his own masterpiece. Despite the unfortunate fate of the mastermind who created it, the Escadaria is an incredibly beautiful work of art, and worth a visit for anyone traveling to Rio de Janeiro. Here, visitors can find picturesque mosaics with individual tiles from all over the world. There is nothing Brazilians love more than a good jogo de futeból (soccer/football game). One of Brazil’s most incredible stadiums is the Maracanã, located in Rio’s downtown area. Several games take place here, ranging from local (Rio de Janeiro team) games, to larger Brazilian league games, to international televised events like the Confederations Cup and the World Cup. To experience just how rowdy and passionate cariocas get about their games, you have to attend one in person. The energy is out-of-this-world. For a workout paired with one of the most stunning views in Rio de Janeiro, head to Vidigal and hike to the top of the famous Dois Irmãos rock formation. This 1.5-2 hour hike is a fairly steep uphill climb, but the most incredible 360 degree views of Rio await you at the top. Rio’s downtown area, called Centro, is home to its various performance venues and museums. 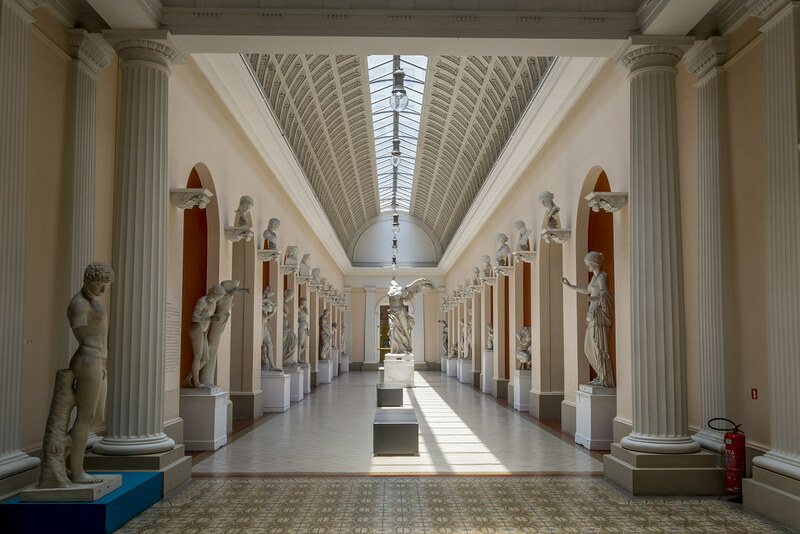 Some of Centro’s highlights include the Municipal Theatre (Teâtro Municipal), the Museum of Tomorrow (Museu do Amanhã), the Museum of Fine Arts (Museu Nacional de Belas Artes), and the Rio Art Museum. Also, the famous Lapa arches are a short walk away, as well as the oddly-designed Metropolitan Cathedral (Catedral Metropolitana). Santa Teresa, situated on a hill near Rio’s Centro, is a charming neighborhood that was historically home to artists and intellectuals. Today, there are still many lovely areas of the neighborhood to explore. It’s a lovely place to walk around, enjoy some art, and soak in the views of the city center. Years ago, Michael Jackson decided to travel to Rio de Janeiro and film a music video in Santa Marta, one of Rio’s favelas. Today, hidden in the now-pacified, colorful neighborhood of Santa Marta is a statue that pays tribute to this historic moment. Visitors can see this statue for themselves after a quick walk through the neighborhood, or you can join a local tour of Santa Marta. Nearby Petrópolis isn’t technically part of Rio de Janeiro, but it’s an interesting and important landmark of Brazilian history. Located about an hour away from the city, it’s a fun day trip to take if you have some time. Here you can see some Portuguese historic homes, go hiking, visit the home of Santos Dumont (argued as the first pilot in flight in all of history), and visit the Bohemia brewery. Rio’s high season is December-March, during which Reveillon (the New Years celebration) and Carnaval occur. This is summertime in Brazil and it gets very hot during the day. Winter in Brazil (June-August) is generally the least crowded season for tourism in the city. During these months, it’s usually still warm enough to hang out at the beach all day, and prices on tourist activities and hotels are typically lower. Lemon Spirit Hostel (R$50+): Just one block from Leblon beach, the location of this hostel can’t be beat. Because of its location in a tropical climate zone, Rio de Janeiro is home to some unique fruits and dishes. On virtually every street corner, you can find small juice shops where you can try some classic flavored juices (mango, apple, passionfruit, pineapple) as well as some strange ones (cajú, avocado, fruta do conde). The best fruit dessert to try in Rio, however, is açaí – a purple smoothie-like substance that is out-of-this-world delicious. When in Brazil, you can’t miss the churrascaria experience. Two of Rio’s local chains are called Porcão and Carretão – I recommend trying these for a taste of Brazilian steak (and, for vegetarians, the salad bars are incredible too!). Other dishes to try in Rio de Janeiro include frango a passarinho (Brazilian-style friend chicken), coxinha (breaded chicken dough balls), pão de queijo (tapioca cheese bread), and brigadeiro (chewy chocolate mini-cakes). Wash these delicious foods down with a cold Guarana Antarctica, coconut water, or Mate Leão (mate iced tea). 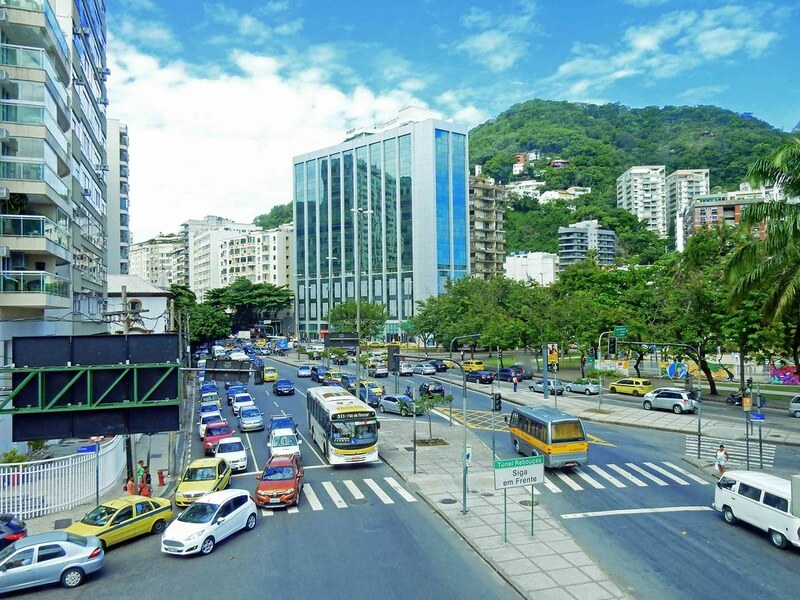 The two best ways to get around Rio de Janeiro are by bus and by taxi/Uber. Buses cost R$3.20 per ride and go anywhere you’d want to go in the city. However, if you’re looking for an easier way to get around, just call a taxi or Uber. If you don’t have international cell service, then taxis are your best bet. Taxis are generally more expensive than Ubers, but both are fairly cheap. Safety is essential in Rio de Janeiro. In Brazil, iPhones and other electronics are especially valuable because of the import taxes, so it is critical to be alert at all times and safeguard your valuables. Robberies and theft are not uncommon, especially in heavily touristed areas. At the beach, avoid bringing anything of value with you. Instead, just bring cash, your keys, and something to lie on. I recommend getting an anti-theft travel backpack to help protect you from any robberies or petty theft. As always, buy travel insurance to protect you from any potential emergencies – we use and recommend World Nomads as our insurance provider of choice. There’s no doubt that Rio de Janeiro is one of the world’s most beautiful and exciting destinations, with plenty of things to see and do. Whether you stay a weekend or for the rest of time, you’ll quickly realize that Rio de Janeiro isn’t just a city, it’s a lifestyle. If you’re planning on visiting a new place, we always recommend purchasing travel insurance. Not only does travel insurance protect you in an emergency, but it also gives you the peace of mind knowing that you’re covered. Our favorite insurance provider is World Nomads, they’ve always had our backs through medical emergencies and more.